There was a lot of hockey news during the week, a lot of it involving the AHL and ECHL. Mark Spector of Sportsnet takes a look at what all transpired and also tosses in a few notes. That’s all right here. So . . . there were these two high school girls hockey teams playing a game in Fargo, N.D.
, on Friday. Spectators and school officials noticed the Zamboni wasn’t being operated in the usual smooth way. It wasn’t long before police arrived, arrested the driver for suspicion of DUI. . . . There is more right here. If you’re into numbers, here’s a Saturday night NHL note for you. G Antti Niemi of the San Jose Sharks wears No. 31. He stopped 31 shots in a 2-0 victory over the visiting Chicago Blackhawks. It was Niemmi’s 31st career shutout. He is 31 years of age. Saturday was Jan. 31. . . . Seriously. In Calgary, G Mack Shields stopped 26 shots to lead the Hitmen to a 5-0 victory over the Edmonton Oil Kings. . . . Shields has two shutouts this season and five in his career. . . . F Jake Virtanen had a goal, his 14th, and three assists. . . . F Adam Tambellini scored twice, giving him 37, and added an assist. He’s got 14 points, 11 of them goals, in his last seven games. . . . D Jake Bean tied the Calgary franchise record for points in a freshman season. Bean had one assist, giving him 32 points in 40 games. 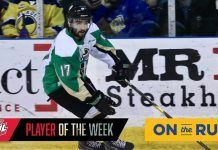 Bean now shares the record with Matt Kinch (1996-97). . . . F Connor Rankin’s 26th goal, at 1:42 of the first period, stood up as the winner. . . . “We were reluctant to get traffic and reluctant to put pucks on net,” Steve Hamilton, the Oil Kings’ head coach, said on the team’s website. “Quite honestly, just didn’t have a ton of time or space today, and it’s a credit to Calgary. They did a good job of executing their game plan, and we didn’t generate much.” . . . The Hitmen (29-17-5) have won a season-high six in a row and now are second in the Central Division, one point ahead of Red Deer. Calgary has put up three shutouts in its past five games. . . . The Oil Kings (24-22-6) had won their previous two games. . . . In Moose Jaw, D Ivan Provorov earned four assists, all on the PP, as the Brandon Wheat Kings beat the Warriors, 6-0. . . . He’s got 50 points, including 39 assists, in 45 games. . . . Brandon G Jordan Papirny stopped 21 shots as he picked up his 30th victory of the season and his fourth shutout. In his career, he has five shutouts. He is 30-7-4 this season. . . . Wheat Kings F Tim McGauley drew three assists. He also got into a scrap with Moose Jaw F Brayden Point. . . . Brandon F Steve Patrick scored his 23rd goal. 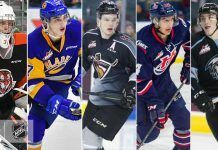 Rob Henderson of the Brandon Sun notes: “Patrick has 23 goals in his first WHL season, matching the number scored by his father, Steve, in his rookie season with Brandon in 1978-79.” . . . Brandon was 4-for-6 on the PP; Moose Jaw was 0-for-4. . . . Moose Jaw F Jesse Shynkaruk took an interference major and game misconduct at 10:23 of the third period. Brandon F John Quenneville was the victim on that play. He left the game and didn’t return. . . . The Wheat Kings beat the visiting Warriors 6-4 on Friday. . . . G Alex Moodie was among Brandon’s scratches after suffering an undisclosed injury on Friday. He has an undisclosed injury. . . . Thomas Spence, an 18-year-old from Moose Jaw, served as Brandon’s backup last night. Spence, who plays for the junior B Regina Capitals, spent a night on the Calgary Hitmen bench on Jan. 6. . . . The Wheat Kings (37-9-5) are 8-0-1 in their last nine games. . . . The Warriors (20-27-4) have lost three in a row and are seven points out of a playoff spot. . . . In Saskatoon, G Nik Amundrud stopped 29 shots to lead the Saskatoon Blades to a 4-0 victory over the Swift Current Broncos. . . . He’s got three shutouts this season. . . . D Brycen Martin, who came to Saskatoon from the Broncos, and F Brett Stovin each had a goal and two assists as the Blades scored three PP goals. . . . Martin has five goals; Stovin has 20. . . . The Blades were 3-for-9 on the PP; the Broncos were 0-for-5. . . . The Broncos remain without D Dillon Heatherington (4-6 weeks), F Coda Gordon (1-3 weeks), D Jordan Harris and F Cole Johnson. The latter two are out indefinitely. . . . Daniel Nugent-Bowman of the Saskatoon StarPhoenix has a game story right here. . . . The Blades improved to 15-31-3 and now are 2-3-0 in the season series. . . . The Broncos (23-23-5) had beaten the visiting Blades 6-2 on Friday and are 3-1-1 in the season series. . . . Swift Current is third in the East Division, seven points ahead of Moose Jaw. . . . In Cranbrook, F Leon Draisaitl had a goal and an assist to lead the Kelowna Rockets to a 5-1 victory over the Kootenay Ice. . . . He’s got 17 points, including seven goals, in 11 games since being acquired from the Prince Albert Raiders. . . . Draisaitl was selected third overall by the Oilers in the NHL’s 2014 draft. . . . Ice F Sam Reinhart was selected second overall by the Buffalo Sabres. He had his 10-game point streak ended by the Rockets. . . . Kelowna G Rourke Chartier opened the scoring with a shorthanded goal at 5:22 of the first period. He’s got 41 goals, moving him back into a tie with Medicine Hat F Cole Sanford for the WHL lead. . . . Rockets D Riley Stadel and F Tyson Baillie each had two assists. . . . Kelowna G Jackson Whistle stopped 25 shots as he earned his 30th victory of the season. 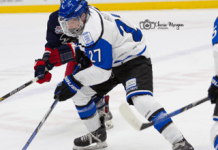 He is 30-7-3. . . . Taylor Rocca of the Cranbrook Daily Townsman has a game story right here. . . . The Rockets (39-8-4) are 5-0-1 in their last six outings. They continue to lead the overall standings by three points over Brandon. . . . The Ice (27-24-1) holds down the Eastern Conference’s first wild-card spot, one point ahead of Edmonton. . . . In Red Deer, the Prince Albert Raiders got the shootout’s only two goals to beat the Rebels, 6-5. . . . Red Deer trailed 5-2 early in the third period but staged a three-goal comeback to force OT. . . . F Riley Sheen scored twice, giving him 15, and F Conner Bleackley tied it 5-5 with his 24th goal at 13:13. . . . The Raiders got shootout goals from F Simon Stransky and F Reid Gardiner to win it. . . . Gardiner scored twice in regulation, giving him 24 goals. . . . Raiders D Jesse Lees drew three assists. . . . Sheen also had an assist for a three-point night. . . . D Colton Bobyk had three assists for the Rebels and F Connor Gay had two. . . . The Raiders were 2-for-4 on the PP; the Rebels were 2-for-3. . . . Prince Albert was without D Mackenze Stewart. He got a ‘tbd’ suspension after taking a cross-checking major and game misconduct in Friday’s 10-1 loss in Calgary. . . . The Raiders (21-28-1) are eight points out of a playoff spot. . . . The Rebels (27-15-8) have lost three in a row (0-1-2) and now are third in the Central Division, one point behind Calgary. . . . In Lethbridge, F Austin Wagner’s two goals helped the Regina Pats to a 6-2 victory over the Hurricanes. . . . F Pavel Skumatov got the Hurricanes on the board first, scoring his fifth goal at 19:56 of the first period. . . . The Pats took control with four goals in 6:01 in the second half of the second period. . . . F Adam Berg got it started with his first goal at 10:24. Wagner, who has 16 goals, gave Regina the lead at 13:30 and F Sam Steel gadded his 12th goal, on the PP, at 15:01. F Patrick D’Amico ended the onslaught with his 15th at 16:25. . . . Regina F Taylor Cooper scored his 20th goal on a third-period penalty shot. . . . Lethbridge was able to dress only 16 skaters. Included in its scratches was F Tyler Wong. . . . The Pats held a 48-30 edge in shots. . . . The Pats (27-17-6) snapped a six-game losing skid (0-3-3) and appear headed to a second-place finish in the East Division. . . . The Hurricanes (12-31-6) have lost two in a row. . . . In Vancouver, the Kamloops Blazers scored on their first two shootout attempts and took a 3-2 victory over the Giants. . . . F Cole Ully and F Jake Kryski gave the Blazers a 2-0 lead in the shootout and that was that. . . . Ully had scored his 25th goal at 1:38 of the first period. . . . Vancouver F Tyler Benson tied it with his 12th goal at 19:57. . . . Blazers D Marc McNulty got his sixth goal at 13:18 of the second. . . . Vancouver F Zane Jones forced OT with his 24th goal at 14:10 of the third. . . . Kamloops G Connor Ingram stopped 32 shots, two more than Vancouver’s Cody Porter. . . . The Blazers had D Ryan Rehill back after a one-game suspension, but D Michael Fora and D Patrik Maier remain out with undisclosed injuries. . . . The Blazers (20-26-6) are third in the B.C. Division, three points ahead of Vancouver and four up on Prince George. . . . The Giants (20-28-3) have lost four in a row (0-3-1). . . . In Prince George, G Taran Kozun stopped 20 shots to help the Seattle Thunderbirds to a 3-0 victory over the Seattle Thunderbirds. . . . Kozun has eight shutouts in his career, two this season. . . . F Ryan Gropp scored his 20th goal of the season 15 seconds into the second period. . . . Seattle F Calvin Spencer scored his fifth goal at 10:10 of the first and it proved the winner. . . . Seattle D Shea Theodore had one assist, moving him into a tie with Craig Channell for the franchise record for most career points by a defenceman. . . . The Cougars were without F Josh Anderson and D Josh Connolly, both of whom drew ‘tbd’ suspensions for incidents in Friday’s game that was won, 9-2, by the Thunderbirds. . . . Seattle (25-19-6) has won two in a row and is third in the U.S. Division. . . . The Cougars (20-31-2) have lost 12 straight (0-10-2). . . . In Portland, F Oliver Bjorkstrand scored three goals and added three assists as the Winterhawks doubled the Everett Silvertips, 6-3. . . . The Silvertips took a 2-1 lead into the second period and nursed it until Bjorkstrand scored his second goal at 19:50. . . . Portland then outscored the visitors 4-1 in the third, with Bjorkstrand getting his 35th goal and drawing assists on the other three goals. . . . Winterhawks F Nic Petan scored once, his 10th, and added three assists, while F Paul Bittner, the third member of that line, had three assists. . . . Portland F Chase De Leo had two goals, giving him 26. . . . Only five Winterhawks earned at least a point. . . . Bjorkstrand has 70 points in 40 games. A truly gifted offensive talent from Herning, Denmark, he has 242 points, including 116 goals, in 174 regular-season games. Including 42 playoff games, he has 296 points, 140 of them goals. . . . The Silvertips got a goal, his sixth, and two assists from D Noah Juulsen. . . . Portland G Adin Hill stopped 22 shots, eight fewer than Everett’s Austin Lotz. . . . Portland was 1-for-2 on the PP; Everett was 2-for-4. . . . The Winterhawks (31-19-3) have won eight in a row and now are one point behind the U.S. Division-leading Silvertips (31-15-4). . . . In Kennewick, Wash., D Jack Walker had the only goal of a shootout to give the Victoria Royals a 3-2 victory over the Tri-City Americans. . . . Tri-City F Richard Nejezchleb forced OT when he scored with 52.1 seconds left in the third period and G Eric Comrie on the bench for the extra attacker. . . . Nejezchleb scored twice in this one, giving him 15. . . . Victoria F Greg Chase had given his side a 2-1 lead with his 15th goal at 1:39 of the third period. . . . Victoria G Coleman Vollrath stopped 22 shots, seven fewer than Tri-City’s Eric Comrie. . . . The Royals (28-20-4) are headed to a second-place finish in the B.C. Division. . . . The Americans (24-24-3) have lost three in a row. They are fifth in the U.S. Division but hold down the Western Conference’s second wild-card spot. . . . In Spokane, D Jason Fram came through in a big way for the Chiefs as they got past the Medicine Hat Tigers 4-3 in a shootout. . . . Fram forced OT with his ninth goal of the season on a PP at 11:04 of the third period. He then scored the game-winner in the shootout. . . . F Dryden Hunt scored for the Tigers in the shootout, with F Dominic Zwerger scoring for the Chiefs. . . . 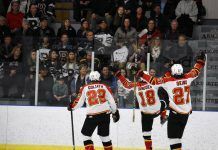 The Chiefs had been outscored 18-1 in their previous five games. . . . Chris Derrick of the Spokane Spokesman-Review reported that Spokane forwards “had been scoreless for more than 344 minutes, back to a Jan. 16 game at Everett.” . . . F Liam Stewart ended that dry spell at 17:29 of the first period. . . . That goal ended a team scoreless drought of more than 223 minutes. . . . Talk about high drama! Tigers F Cole Sanford, who is tied for the WHL lead with 41 goals, was presented with a penalty shot with 28 seconds left in the third period and the score 3-3. Spokane G Garret Hughson stopped him. . . . Medicine Hat D Ty Stanton had a goal, his sixth, and two assists. . . . The Chiefs (24-21-4) had been 0-6-1 in their previous seven games. They had been blanked in three straight games. . . . The victory lifted Spokane into sole possession of fourth place in the U.S. Division, four points behind Seattle and one ahead of Tri-City. . . . The Central Division-leading Tigers (35-12-3) had a six-game winning streak snapped.